Long before the era of IoT and smart homes, people prefer to depend on themselves for solving regular household complications. But events like losing the keychain or umbrella are still ubiquitous which push us at our wit’s end. The idea of tracking easy-to-lost objects efficiently is nothing new. US based Tile came up an handy solution: a tiny gizmo which needs to be attached with the item and a companion smartphone app for ‘ringing’ it. The underlying technology is nothing but Bluetooth, but the smart guys of Tile used crowd GPS to make things smarter. OnePlus and Tile share a complicated relationship. Many users started reporting issues with OnePlus phones and the trackers from Tile. The affected users experienced glitches in connection, particularly after upgrading to Android 9 Pie. @OnePlus_Support I have just learned that something about my OP6 bluetooth prevents it from working with Tile. When should I expect this to be resolved? Yo @TheTileApp and @OnePlus_Support You two need to talk to one another. I have an open case with both of you as I can't pair my OP6t. Tile says its a known issue with OP6/6t, One Plus support can't verify this & troubleshooting is crap. Sending commands for Android 8, not 9. Both OnePlus 5 and 6, along with their ‘T’ variants are part of roster of affected phones. Tile and OnePlus were pointing fingers towards each other, and the saga did not stop. Annoyed users filed bug reports on OnePlus forums as well (example: here, here, here). T-Mobile was also notified as the carrier exclusive OnePlus 6T variant was not free from the problem. FYI, there was a similar outage with Tile trackers in past. The buggy Bluetooth stack of Android 6.0.x Marshmallow was the offender then. Meanwhile Tile publicly accused OnePlus for their buggy BLE (Bluetooth Low Energy) implementation. Later on, OnePlus kind of accepted that the bug was originated from their end. The fix should come as a part of end of January’s Open Beta builds, but those updates were pulled back as they started to brick phones. Now Jeff. 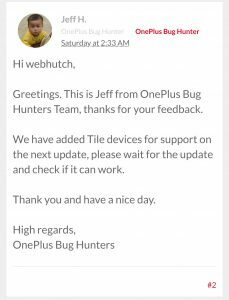 H, member of OnePlus Bug Hunter team, posted another update on the matter. OnePlus will roll out the fix along with the next stable update, at least for OnePlus 6(T). The post was made on last Saturday (2nd February, 2019), and no new update from OnePlus is released so far. PiunikaWeb is here to inform you about OnePlus OTA updates, so stay tuned and follow us! BTW, has anyone seen my keyring?